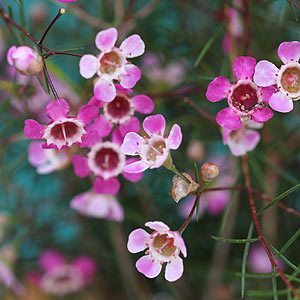 A native shrub growing to around 2m, Chamelaucium uncinatum is tcommonly called the Geraldton Wax flower. However the varieties offered for sale and grown in Australian gardens are generally hybrids with improved vigour and larger flowers. With over 30 Chamelaucium species, hybridization has produced some of the best cut flowers available, and in the garden they can be easy care plants. As cut flowers, they are Australia’s leading commercial wildflower. 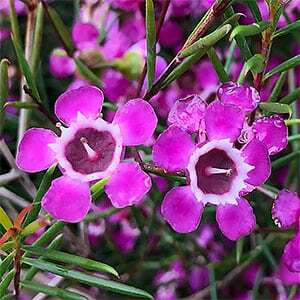 The secret to growing Geraldton Wax plants is mimic their natural conditions, sun, good drainage and neglect. In nature they grow in poor sandy soils and do not need lots of fertilizer and rarely require watering. Drainage is age most important aspect, as in wet soils they will quickly die as they are susceptible to root diseases. In areas where soils are naturally wet, try raising the level of the garden bed and planting Geraldton Wax on the raised section. Chamelaucium grow well if planted in late winter to spring, they will require water through the first summer, once established, little to no water is required except in extended very dry periods. If you are going to use a fertiliser, make sure that is low phosphate and use it sparingly. One of the main problems is lack of sun, you will be better to plant in good sun than trying to treat then for the problems which tends to develop in shade. Use Chamelaucium as a feature plant in the garden, as a low hedge or grow in containers. Also widely grown for cut flowers. When in flower this is a great plant for attracting birds, butterflies and bees to the garden. These are a tallish plant, reaching 2 – 2.5 metres, they look great with Westringea and Correa, and can be used with many other native plants. They can also be used with Salvias, Santolina and Lavenders.. This is one Australian native that responds well to pruning. 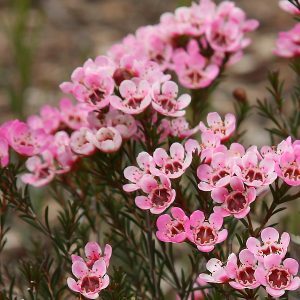 The best time to prune Geraldton wax flowers is in spring, immediately after flowering. Plants can be hard pruned, this ensures a dense bushy growth and more flowers in the next season. prune back by 1/3 each year as a guide. In the home garden they are often kept pruned to form a shaped bush. A well drained soil and a sunny position will suit best. You can also deadhead after flowering, just make sure that you do not prune back into old wood with no green growth on it. From seed or from softwood cuttings taken in spring. Spread – Will reach a width of 2 – 5 metres. Flower colour – White, yellow, pink to purple. Flowering season – Late spring through summer. Foliage – Mid to deep green and aromatic when rubbed or crushed. Grafted varieties of Geraldton wax or Chamelaucium are more resistant to disease. However in good conditions they are all relatively easy to grow. The modern hybrids come in an outstanding number of varieties, flowers from white and pink to reds and yellows. These hybrids also have larger flowers. Most varieties will reach around 2m in height. C. ‘Teina’s Delight’ has pink to tangerine flowers. C. ‘Blossom Magic’ has darker red flowers. C. ‘My Sweet 16’ – interesting form with white flowers that turn to red over a period, so both red and white flowers at the same time. C. ‘Moon Delight’ – attractive red buds through winter followed by white flowers in spring. C. ‘Chantilly Lace’ – tall stems with white flowers, later flowering. C. ‘Lady Stephanie’. – More compact than some reaching around 2m in height. Pale pink flowers in profusion. C. ‘Meringur Mist’. This is a hybrid C. floriferum x unicatum. Reaches 2 – 3 m in height and can be made more compact by pruning. C. ‘Purple Pride’. – Reaches around 4m in height and spreads over 3m. Upright growth habit with two toned purple flowers. C. ciliatum – Sterling Wax, lower growing to 1 metre.